Liberato Bertone first appears in the Painesville, Ohio, area in 1911. He migrated to Painesville from Conneaut, Ohio, in 1911, with his brothers Giovanni and Sabatino. 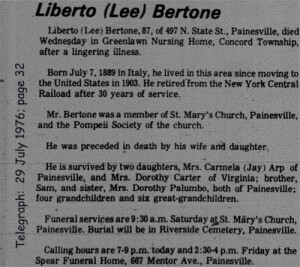 In America, Liberato Bertone was known as Lee Bertone. Liberato Bertone, son of Nicola Bertone and Maria Giancola, was born on July 7, 1889, at Sant’Angelo in Grotte, Italy. He married Maria Cardegna, daughter of Michele Arcangelo Cardegna and Maria Orazia Gentile, on November 28, 1912 at St. Mary Catholic Church, Painesville, Lake County, Ohio. Liberato died on July 28, 1976, at Greenlawn Nursing Home, Concord Township, Lake County, Ohio, at age 87. His body was interred at St. Mary Cemetery at Painesville Township, Lake County, Ohio. Liberato Bertone, age 15, immigrated to the United States on April 13, 1905, travelling to Conneaut, Ashtabula County, Ohio. Liberato Bertone established residence in Painesville, Ohio, in 1911. His wife, Maria, died in 1918, leaving Liberato to raise their three daughters. He became a citizen of the United States on February 8, 1945. Liberato resided at 497 North State Street, Painesville, Lake County, Ohio, when he was naturalized. At the time of death, Liberato resided at 497 North State Street, Painesville, Lake County, Ohio. 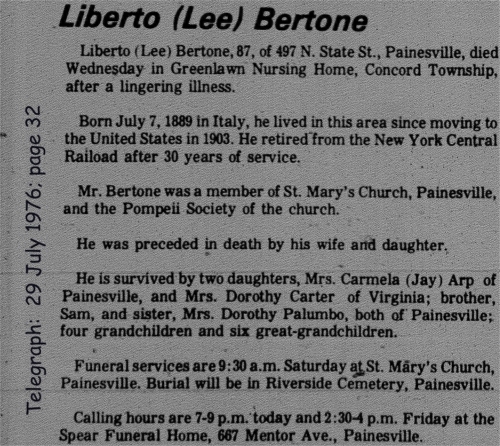 Mr. Bertone was employed by the New York Central Railroad, retiring after 30 years of service.